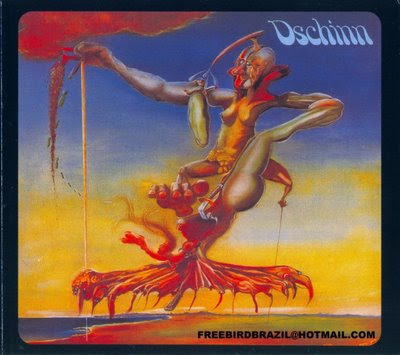 The Dschinn record had a very convincing Dali plagiate painting on its sleeve, courtesy of one Klaus Holitzka. I can reveal that the music isn't as surrealistic as the sleeve would imply, it's a quite conventional type of hard rock. This is not meant as a criticism, though - it is a great album! The lack of originality is nonchalantly replaced by sheer power, both in the music and the vocals. They wrote all nine tracks together, except for the cover version of "For Your Love". It was recorded at Tonstudio Mitte, Bremen and produced by Rolf Jenzen, a character unknown to me. Sadly this one album is their sole legacy, apart from a track on the 1973 sampler Mama Rock & The Sons Of Rock'n'Roll (Bacillus BLS 5526; 2nd edition BAC 2025), named "Rock'n'Roll Dschinny". Not even a single was lifted from their eponymous album and the group disappeared without trace.